As we passed through the outskirts of Nazareth in the Galilee region of Northern Israel heading East, I flipped through my guidebook looking at the road ahead. 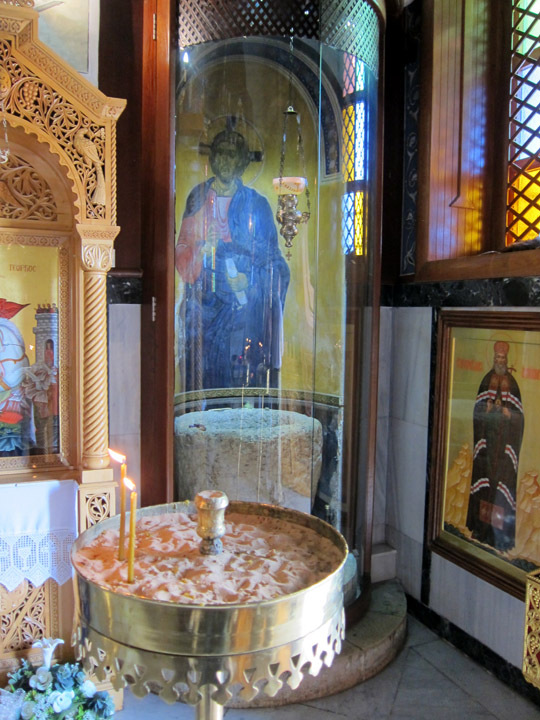 I saw that the Greek Orthodox Church of Cana claimed to have the actual jars from Jesus’ first miracle. If you don’t know the story, the wine ran out too early at Jesus’ cousin’s wedding. 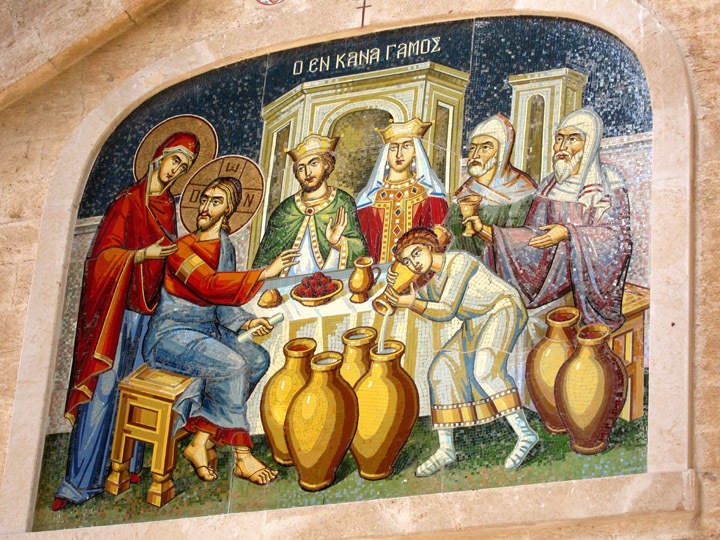 At the behest of his mother and to save the couple from embarrassment, Jesus transforms water into (very good) wine. This is the first miracle Jesus performs in the Gospel of John, possibly the best mother-teenage son interaction ever recorded, and signifies the start of Jesus’ ministry. When I first set foot in St. Peter’s in Rome, I was awed by the majesty of the building with its over the top marble and gold decorations. It did not however strike me as much of a holy place. With that disappointment in mind, I suspended belief somewhat before traveling to Israel. My “I don’t need to see to believe” attitude was more protective than anything. I was more than willing to be impressed; I just didn’t want to be let down. So more in the spirit of finding a good Roadside Attraction rather than completing a spiritual quest, I decided that the miraculous wine jugs were just too good not to pull over and see. 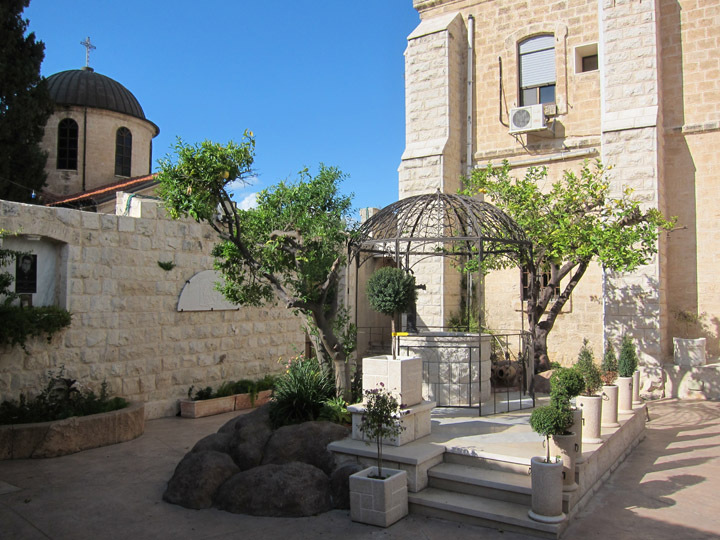 From the courtyard of the Franciscan monastery you can see the Greek Orthodox Church next door to the left. 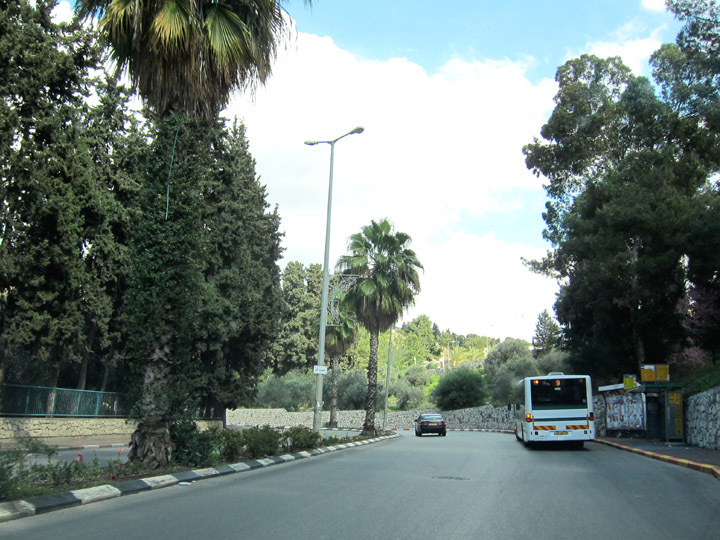 Leaving Nazareth, the national highway cut down to a single lane and ran straight through the village of Cana. The sidewalks were lined with school children just let out of classes and souvenir shops selling small bottles of wine. Parking on the side of the road, we walked to the Greek church past fresh juice carts and bored shop owners. The religious complex seemed deserted. Following the posted instructions, we let ourselves into the monastery through a wrought iron gate. From the small stone courtyard, I saw a compact but familiar looking church. The shape was nearly square and caped with a circular cupola like lots of other provincial, Byzantine-style churches I’d seen in Greece. I looked again for caretakers but found no one; so I stepped inside the open church. The interior was ablaze with color. All the walls of the church were covered with frescoes. I was surrounded by Saints and biblical scenes executed in the most dazzling reds, greens and yellows. The images were exquisitely crisp and bold. I was overwhelmed by the brilliance of the art. I realized I was seeing what the faded and damaged churches of Mystras and Hosios Loukas were supposed to look like. I walked into the center of the small church and just slowly spun around in one spot absorbing all the decorations. 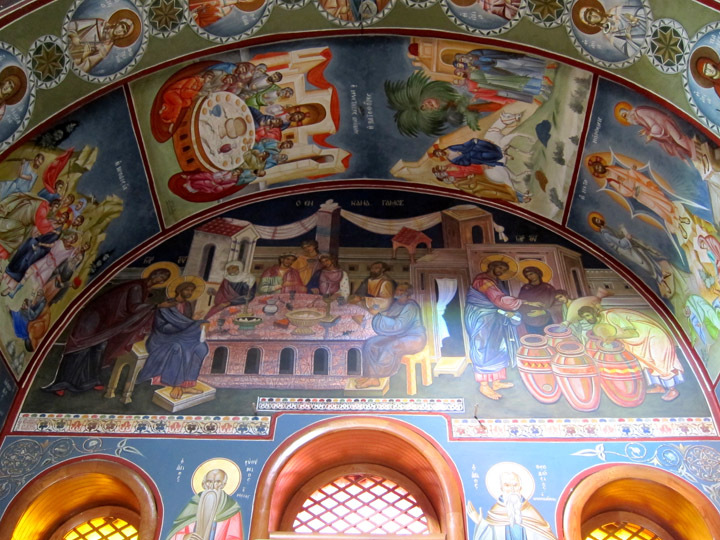 Wall paintings inside the church. Out of shear respect for this beautiful place, I only took one picture of the walls: the Wedding Feast at Cana scene. The complexity and length of the story makes for an interesting iconography. As you’d imagine, this scene was repeated several times throughout the church at Cana but with elegant stylistic differences and poignant figural changes in each version. I did of course also find the miraculous stone wine jugs. There were two, each located by a side entrance. One was encased with a icon of Mary, the other with Christ. Money, prayer notes, and bracelets were scattered over the relics. Interestingly the antique wine jugs looked more like stone storage vats than like the amphora pictured in nearly every image of the Miracle of Cana (including the images at Cana itself). Jesus and the miraculous stone jug. Leaving the church, we found a door marked Gift Shop. Generally I buy books, postcards, or other trinkets from sites I like as a way of supporting them, so I went inside. Turns out the “gift shop” was actually the monastery’s kitchen and I abruptly walked in on a monk reading at the dinner table! Unsurprised, he waved us in and laughed at our hasty apology in Greek. (One of the few phrases I still remember!) He asked about our travels in Greece, how much of Israel we had seen so far and recommended some churches for us to visit. A fairly young man, he explained that this was the first time he’d left Greece and was spending three years tending to the Church in Cana. “Come,” he said moving to the cabinets. “We always share a small glass of wine with pilgrims who come to our church.” Into three plastic shot-glass size cups, he poured a small drink of an incredibly deep garnet-colored wine. The wine was much sweeter than I expected and thick so that I had to sip slowly. Already feeling grateful for the chance to drink wine with a Greek monk in Cana, I thanked him for the beautiful church. I explained how breathtaking and vivid the art was, how much I had enjoyed seeing it, and how glad I was that we had stopped by. “Yes this church is beautiful, but it is nothing compared to the beauty of the miracle performed here,” the monk mused without missing a beat. Continuing to sip, he looked out through the kitchen window at the church outside as we all thought about that a moment longer. Wedding Feast icon just inside the church at Cana. The amazing thing about seeing art in churches is remembering that each work is an expression of faith. While I love the Greek Byzantine style of art for its composition, color, and stylized execution, each painting in the Church of Cana has a purpose. Each Saint is a teacher and exemplar of how we could live a good life. The Bible scenes are lessons and also visual representations of complex theological concepts. Beneath the paint, the second layer of beauty in this church is the celebration of faith and the represented commitment to the Church and God to the people through these images of hopeful miracles, devout faith, and eternal love. If I thought the images were powerful when I first saw them, they became even more so as I thought about them on the drive out of town. A gorgeous Byzantine style church, a spiritual reflection about beauty and faith, plus a little wine – definitely much more than I expected from this “roadside attraction”.